The Occupy movement have been evicted from their Bank of Ideas building in Sun Street just days after a failed occupation of another former banking office in the City. A possession order was served on the protesters after the building's owners, Swiss investment bank UBS, won a a legal case against the group. Occupy had attempted to shift operations to a new site in Leadenhall Street which housed the now-defunct Iraqi Rafidain Bank as well as the former Midland Bank at St Alphage Highwalk but they were evicted by police. They also took over and then abandoned Roman House in Barbican after concerns were raised that their presence would result in loss of work for contractors employed to strip asbestos from the building. The Bank of Ideas has been open since 18 November 2011 and hosted a variety of arts and community events with talks, workshops, lectures, film screenings, conferences, debates and performances. 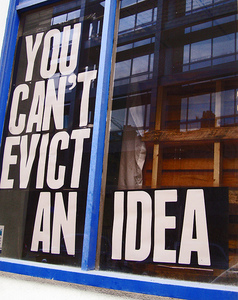 Could Occupy have lost their impetus with the latest series of evictions? We imagine that owners of empty buildings in the City must now be wise to the possibility of occupation and have taken appropriate measures to secure properties. The police are also not being slow to use their powers to prevent Occupy getting their feet under the table. Or are we simply looking at a cunning feint while the group prepare to re-open the Bank of Ideas somewhere unexpected? The group look set to lose their initial St Paul's flagship site too after the City of London Corporation won their bid to remove the camp. With the Olympics bearing down on London, protest camps are being targeted - the long-standing Parliament Square camp was recently removed and ministers have called upon Olympics organisers to ban tents to prevent Occupy-style camps from being pitched. A video of Sunday's eviction was streamed live on the Bank of Ideas website where the group say they will keep supporters up to date.